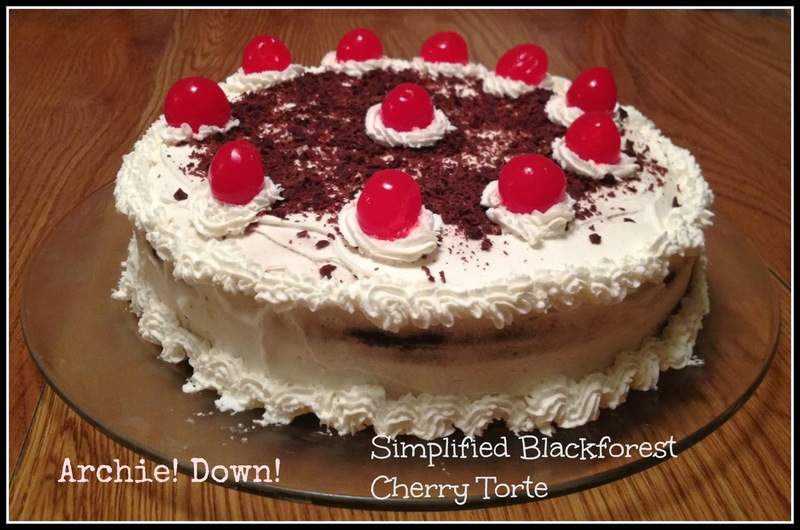 After I posted a few pictures of my Simplified Blackforest Cherry Torte on Facebook, I had several friends ask if I would please post the recipe. Well, here you go. As a native German, I grew up eating this gorgeous dessert. My mother used to make a wonderful Schwarzwälder Kirschtorte and I'd like to say I learned from her. But I've been cheating for a long time now and making a simpler two layer version which comes together quickly and tastes just as good as the fancier three layer. The other sin I commit when making this cake is my omission of Kirschwasser. Since this cake is essentially a quick way of occluding your arteries I make it very rarely. An entire bottle of Kirschwasser is simply too much to buy for this rare occasion. We use rum instead. Rum and cherries are great together and so is rum and chocolate. What could possibly go wrong? The original way to make this cake is with a sturdier type of dough at the bottom to support the cake. I skip this part shamelessly. I also use sweet canned cherries if fresh ones aren't available. The Chocolate Cake Base which I use isn't very sweet making it quite useful in recipes where sweet fillings are included. I had last made this cake many years ago and neither of our kids much liked it. Since there were only two of us (adults) eating it, part of it went into the trash. Besides, we are getting too old to eat this cake without mentally putting a cardiologist on speed dial. Lately however, my husband had been pining loudly for this cake, and with my father in-law's first birthday since moving in with us, I felt obliged to comply. Mix all dry ingredients in a bowl. Add all moist ingredients and stir well. Pour the batter into a greased and floured springform pan and bake in a preheated oven at 350F for about 50 minutes. When I baked this cake recently I used part of the batter (maybe a third of it) to make a smaller 'virgin' cake for my seven year old. By letting the cake to cool completely before cutting it in half you can reduce the amount of crumbling you get. Allow the cake to rest cut open for an hour before assembling it. I usually cut the dome off the top of the cake to have a nice flat surface. Place bottom half of cake on your cake stand. I place some wax paper around the edges to keep things clean. Sprinkle some of the cherry flavored rum on the base and then thinly spread some of that red jelly over the base. This helps prevent the base from becoming too soggy. You need only a little since you don't want to be able to taste the jelly. Thickly spread whipped cream on the base and then place the drained cherries on the base. Cover the cherries with another layer of cream. Take the top layer of cake and turn it upside down (cut side up) and sprinkle with the cherry infused rum. Then spread some jelly over the cut area. Place the cut side down on top of the cream covered cherries. If you did need to cut the 'dome' of the cake make sure to coat the cut part with a super thin layer of jelly. Coat the entire cake with a thin layer of cream and allow to cool for half an hour before proceeding. This will ensure a more finished appearance later on. To finish the cake reserve some of the cream for piping and spread the rest evenly over the chilled cake. Sprinkle the top with the grated chocolate and pipe rosettes around the edge. Place a maraschino cherry on each rosette. Remove the wax paper pieces you used to keep the plate clean. Pipe a simple edging along the bottom edge of the cake and chill at least an hour before serving. Food is a way of life in our family. My German-Indian heritage combined with my American experience has kindled in me a love of many different cuisines. In a give-away competition I once called myself a 'slightly schizophrenic globe trotter' on account of my love of so many different types of food. My family loves meat (unfortunately), but I do try to make as many vegetarian meals as possible. Many of the recipes in this blog can be found on my other blog http://archiedown.wordpress.com which isn't a 'food only' blog. But I wanted to create a food only blog and therefore copied many of the recipes into this blog. I would love to hear from you. If you have questions or comments, feel free to contact me via feedback or my email. If you would like to contact me directly you can e-mail me at rb3continents at yahoo dot com.